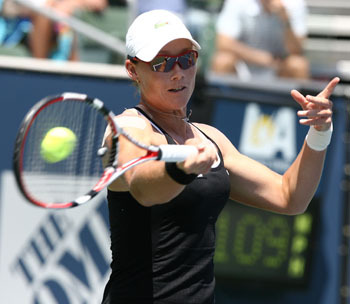 CARSON, CA - Sunday may be the day Australian Samantha Stosur checks another goal off her list. She’s poised to win her first WTA singles title. The 19th ranked right-hander already has a slew of doubles titles, 22 to be exact. After four trips to the Los Angeles Women’s Tennis Championships, this is the first time Stosur had made it to the finals, let alone the semifinals or quarterfinals. A confident Stosur won relatively easily over Romanian Sorana Cirstea Saturday at the Home Depot Center in Carson, 6-3, 6-2. And stick to her game she did. The lady from down under was quickly up in the first set 3-1. She would not let Cirstea hold serves more than three times. In the second set, the 19-year-old was barely able to win two service games. “I never really let her get into it,” Stosur said. Stosur was relentless. With her wicked kick serves and powerful forehands she took full advantage of Cirstea’s recent injury. Last week, the tour up and comer developed painful plantar fasciitis on the bottom of her right heel while switching from clay and grass courts to hard courts. Sobbing on changeovers, she nearly threw in the towel during her match Friday against Poland’s Agnieszka Radwanski, a match that she ended up winning in three sets. As for Stosur, she’s headed to tournaments in Toronto and New Haven next. And after her strong showing here in Los Angeles, she’ll probably move up a few slots from her current #19 ranking. In a semi-final match filled with errors 27 year old Flavia Pannetta and 22 year old Maria Sharapova went the distance. Pannetta sustained a pounding from Sharapova 6-2, 4-6, 6-3 to reach her second LA Women's Tennis Championship final. With Sharapova double faulting 13 times in her previous match, choosing to receive was an obvious choice for Pannetta to start the match. Sharapova appeared to have a plan and tried to hit deep balls to Pannetta's backhand. Pannetta was prepared to exchange long powerful rallies and took the first set 6-2. Pannetta said, "I was waiting for her to make mistakes in the second set." Sharapova had other ideas. At 4-4 the crowd was involved, along with Sharapova's coach and father, urging her to take each point. Down 0-40, Sharapova served well to get to duece. She came to the net and successfully executed her classic swinging volley for a winner. Then an ace to go ahead 5-4. A glimpse of the Grand Slam champion could be seen at this critical moment. The stadium roared as they traded backhands. Sharapova aggressively took the second set with loud grunts and fist pumps. 10 of the 16 double faults by Sharapova occurred in the third set. At 3-3 , the balls looked heavy as Sharapova gifted three double faults and the game to Pannetta. Sharapova admitted, "I had my opportunities but I couldn't close it out." and "I wanted to attack which caused more errors." Too many errors allowed Pannetta to take the third set 6-3. After committing 61 errors. Sharapova said, "I'm not losing confidence." "Am I happy where it is (her game)? Certainly not, there is still a lot of work to do." Accepting her defeat, "Nothing a basket of balls can't achieve." About her come-back, "I sometimes want to forget that I was out for a long time but sometimes you have to put things in perspective." Sharapova turned pro in 2001 at the age of 14. She holds three Grand Slam titles; Wimbledon 2004, US Open 2006, and the Australian Open in 2008. In 2004, she won the WTA year-end championships. Sharapova held the No. 1 ranking in the world for a couple months in 2005, 2007, and 2008. In August of 2008 MRI results revealed a rotator cuff tear. She had surgery in October and is back on the tour. Currently ranked #61, Sharapova should see an improved ranking after this week. Seeded 10th in this tournament, Pannetta will meet 13th seed Sam Stosur of Australia in the final.